CUALA and Na Piarsaigh played out a breathless draw in today;s All-Ireland club hurling final. The 2017 and 2016 champions will meet again next week at a date and time to be decided by the CCCC on Monday after extra-time failed to separate them in a frozen Croke Park today. They were 0-4 to 0-1 up after 17 minutes, playing into a stiff and frozen wind. Their captain, Paul Schütte, returned after a hamstring injury that kept him out of their semi-final win over Liam Mellows and going man-for-man with a talent, physical Na Piarsaigh attack, the Cuala defence thrived for the first 20 minutes. Mostly, Na Piaraigh full-back, Mike Casey stayed glued to Con O'Callaghan but the 2016 champions also got bodies around the reigning Young Footballer of the Year each time he won possession. O'Callaghan won two converted frees in the half on a day when the conditions meant scores were at a premium. Kevin Downes and Adrian Breen sprang to life at just the right time for the Limerick side, however, who scored the last four points of the half to go in two points up. Given the strength of the wind, two points seemed an inadequate lead but Na Piarsaigh pinched a goal early in the second half when Peter Casey squeezed a shot past Seán Brennan. 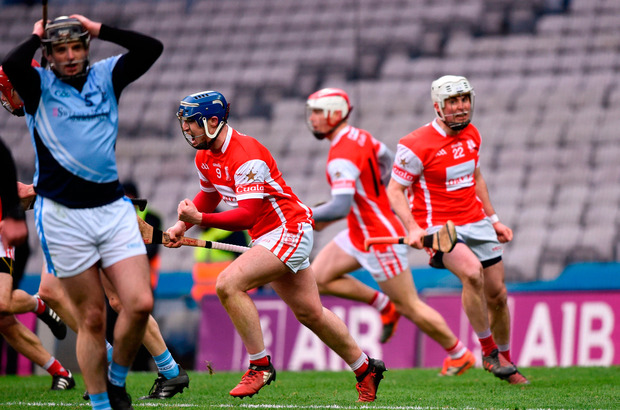 Cuala rattled off five points in a row by way of response but again, Na Piarsaigh finished the half stronger and looked to be home and hosed when they led by three points in the final minute of the three allotted for injury time. Cuala won a free from close in, however, and Seán Moran blazed a shot at the throng of bodies on the Na Piarsiagh line. Goalkeeper, Podge Kenny, got a hurley to the shot but deflected it into his own net. That score sent the game to extra-time, wherein David Breen scored an early goal to give Na Piarsaigh and early advantage but Cuala fought back and as the clock ticked towards 80 minutes, Nicky Kenny forced a free. David Treacy held his nerve to convert from 60 yards into the wind and though O’Callaghan had a late chance to win it, his shot fell well short. SCORERS – Cuala: D Treacy 0-12 (12f), S Treacy 0-3, S Moran 1—0 (pen), D O’Connell, C Cronin, C Sheanon, M Schütte, Con O’Callaghan, N Kenny 0-1 each. Na Piarsaigh: S Dowling 0-6 (4f), P Casey 1-2, A Breen, K Downes 0-4 each, D Breen 1-1, D Dempsey 0-2.